Last Friday Göteborg received a visitor from Australia, who happened also to be a friend of mine and to whom I was quite eager to show off my city. As I explained to him (repeatedly) he was extremely lucky with the weather. The day started with fog, which then turned to bright sunshine and clear skies and stayed so until evening, which was slightly chilly and still clear. The fact that the next day was mostly cloudy proves my point I think. The fact that the following few days have been bright and sunny is something that I choose to ignore in this discussion. We met at noon and began the tour with a stroll to Brunnsparken and then down Östra Hamngatan to Kungsportsplatsen, dodging political cabins, placard-bearers and trams, and mingling with the sun-blissed Swedes filling the pavements. 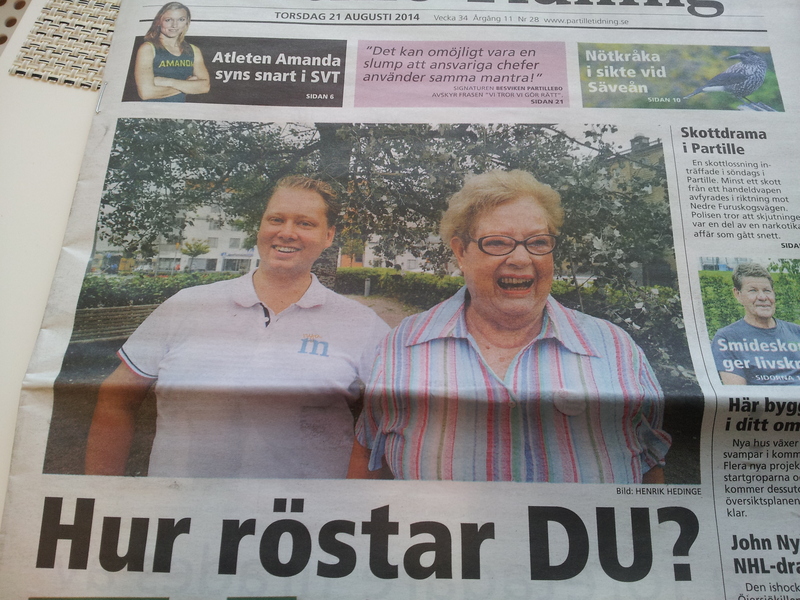 At Kungsortsplatsen I pointed out the Kopparmärra, chuckling with someone who I suspect was hoping to entice me to vote for some party or other, about the obvious inaccuracy of the ‘mare’ title. Hoping to escape more hopeful pamphlet bearers, we crossed the street and made for the first destination of our tour: Saluhallen. We stared around at the cheese, meat, baked goods and spice stalls, pausing for a bit at the baked goods, and then found 2 seats at one of the restaurants in the centre. I had been introduced to this place by a friend, with whom I’d shared a delicious lunch of fish burgers and salad, and planned to present my visiting friend with something authentically Swedish. As the days special was no longer fish burger, we instead tucked into also very traditional beef burgers with potato and lingonberry sauce. Well fortified for a day of wandering, we left Saluhallen and strolled along the canals, where people basked on the walls and grassy slopes. 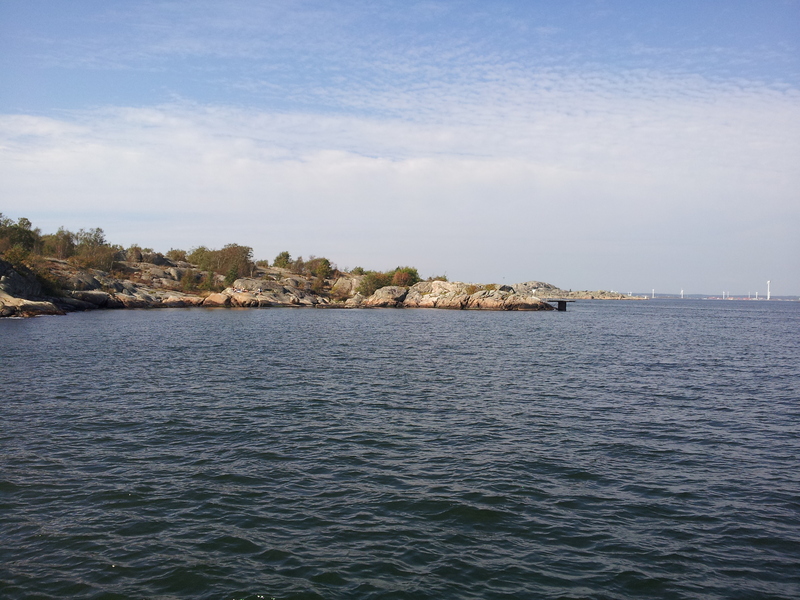 A tram ride then took us to Saltholmen, where we caught a ferry to Brännö, an island in the southern archipelago. 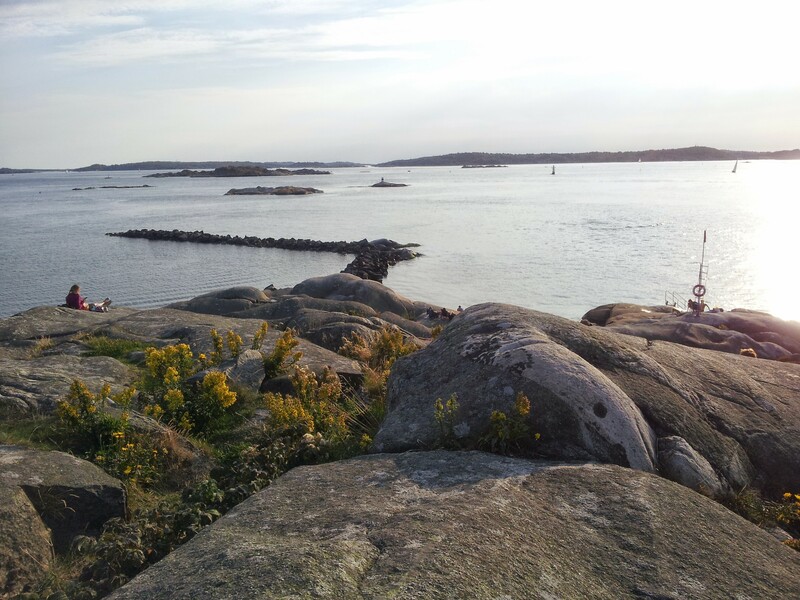 I’ve been to Brännö before, for a walk and a drink, but I hadn’t explored as much as this time. 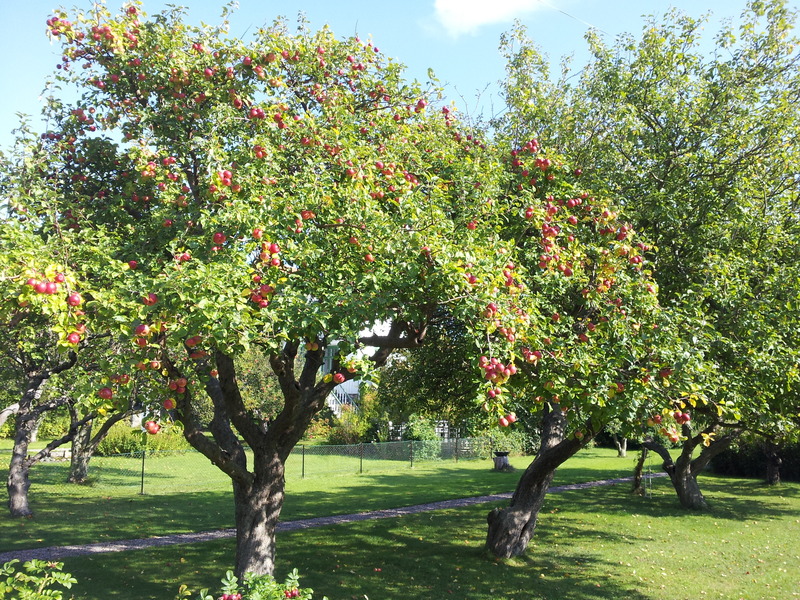 The sun was out and the trees were overflowing with apples, unfortunately all out of reach of my hands, if not my hungry eyes. It was quiet, apart from the occasional local and chatty sheep, and we even found some lingering blackberries. We then caught a ferry back to the mainland, and a tram back to town and continued our strolling through Haga, one of the prettiest parts of Göteborg. The cafes were still open and a brass band was playing in the main square. 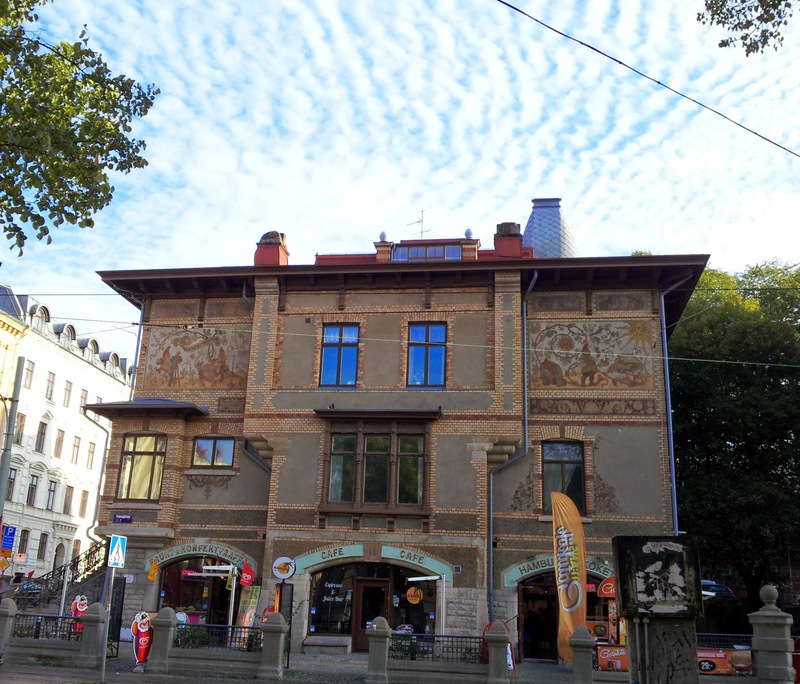 We didn’t climb up to Skansen Kronen, choosing instead to admire it from below, and then continued along Vasagatan. The political posters were still adorning every tree, pole, lamp post and bus stop, and we took our time considering their positions and trying to spot SD. Vasagatan then turned into Avenyn and so we went up to ogle the statue of Poseidon, and example of what art ought not to be. Then to a restaurant for drinks, food and meeting my partner, with whom we wandered to another bar for more drinks and finally wandered back to the hotel to bid my friend goodbye. We both assured him, again, that the weather had been pretty miraculous and that he’d be welcome to explore out fine little city the next time he was up north. We then parted ways and headed home. I hope that we will get more visitors who we can show around town, if only so that I have an excuse for a leisurely walk on a sunny island. 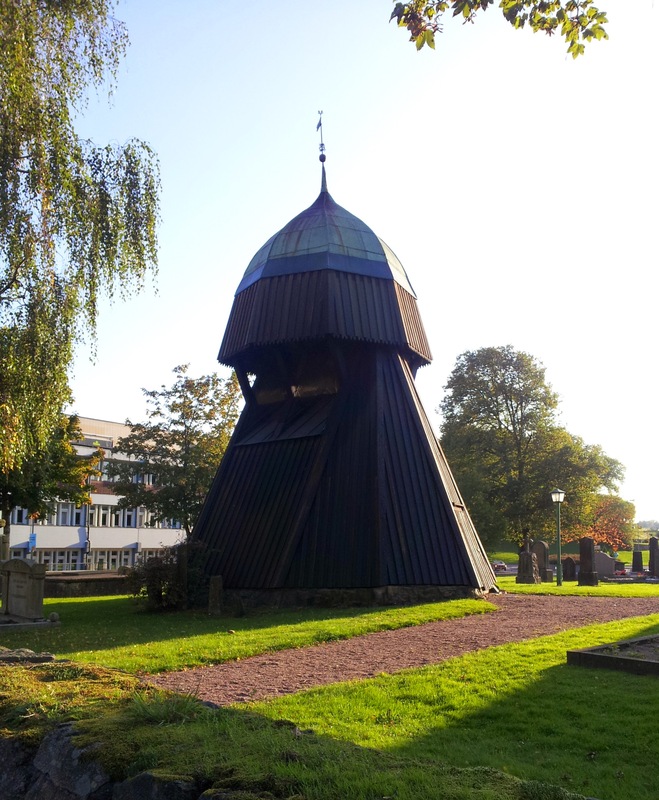 As promised, I have finally written a post about our visit to Nordens Ark last year. It is a tale of a surprisingly sunny day, playful red pandas, hungry snow leopards and extremely unimpressed cats. Plus a little ponderance about the ethics of zoos and the power of caged animals. As you may have guessed from the name, Nordens Ark is a zoo, and it specialises in endangered and threatened animals, running breeding programs and educating about the issues that endanger these creatures. For obvious reasons it specialises in European animals, though some of the critters that are exceptions to this rule greeted us as we walked in. They were furry, red and continually pounced on each other, tumbling about in a manner that made all 4 of the women in our little group coo and melt slightly. I dare anyone to resist the charms of red pandas, even from a distance. The two guys stood at a slight distance, trying to translate the cooing sounds (there is a specific Swedish word that refers to cute things, it seems), but not protesting about staying at the enclosure for a bit longer. Continuing along the designated trail, we found very sure-footed mountain goats, lynxs hiding on cliffs and owls, inlcuding Hedwig who looked rather miffed to be in captivity, though given that she was killed I’d have thought she’d be relieved (I’m not going to apologise for spoilers, because if you’re worried about them you really should have read the books by now, honestly). We also came across some animals that I had been looking forward to seeing since I’d first heard about Nordens Ark, and started badgering my partner into visiting. A herd of the slightly hard to pronounce, and spell, Przewalski’s wild horse. These horses are the only remaining species of wild horse left in the world, a breed that has never been domesticated and until recently was extinct in the wild. As a historically minded horsey-girl from way back, I have long wanted to see one, and practically ran down the path when we neared the enclosure. They looked like fuzzy ponies, as they had already grown their winter coats, and I was enraptured. Further along, we encountered a breed of cat that was even less impressed with us than Hedwig had been. Despite it’s name, the Pallas cat, implying to me some sense of wisdom (see: Pallas Athena), the impression I got was a sense of extreme grumpiness and just cannot-be-botheredness. For most of the time that we stood and watched (and giggled) at the cat, it sat with it’s back to us, apparently staring at a rock. The picture below was taken in the brief moment it deigned to glance at us, grumpily, and then turned back to it’s vital rock-staring. Very soon, however, we came across other felines who were not of the grumpy persuasion. They were some of the most beautiful animals I have ever seen, and whose near extinction seems one of the most tragic. Fortunately for them, and us, the breeding program seems to be going well, and so we were able to see a total of 5 snow leopards. The father was in his own enclosure, lazing about and considering the hunk of meat that had been hung from a tree for his lunch, while the mother and 3 cups were variously relaxing and attempting to reach their own lunch. From what we could tell, the cubs have a lot to learn about such things as climbing trees, reaching out for food and critically, not falling down all the time. While the cubs tumbled, swiped and climbed the mother watched and walked around. She reminded me of one of the negative aspects of a zoo; it is more or less a prison. Yes, it protects animals that may otherwise starve or be hunted in the wild and it helps educate people, but at the same time it deprives those it protects of their ability to be wild. Maybe someday we’ll find a compromise, and I hope that the descendants of the snow leopards we saw that day will still be around to benefit from it. By this point it was reaching our own lunchtime, and so we headed for the wolf building, a large hut with glass sides that looked out over the wolf enclosure. As we sat and enjoyed our picnic and sipped hot chocolate mixed with Baileys (oh yes), we saw no sign of the wolves. It seems that there had been some health scare or breeding issue, so all but one of the wolves in Nordens Ark had been removed. After lunch we had another look, but could see nothing. As the others went on to the next enclosure I saw a small movement among the trees and watched carefully for a while until it coalesced into the shape of a wolf. It stood there for a short time and then disappeared. It was the first wolf I had ever seen. We then passed reindeer, frogs, raptors and almost missed seeing the most threatened cat in the world. There was only one Amur leopard in the park, sitting on a rock in what seemed a smaller enclosure than the snow leopards. 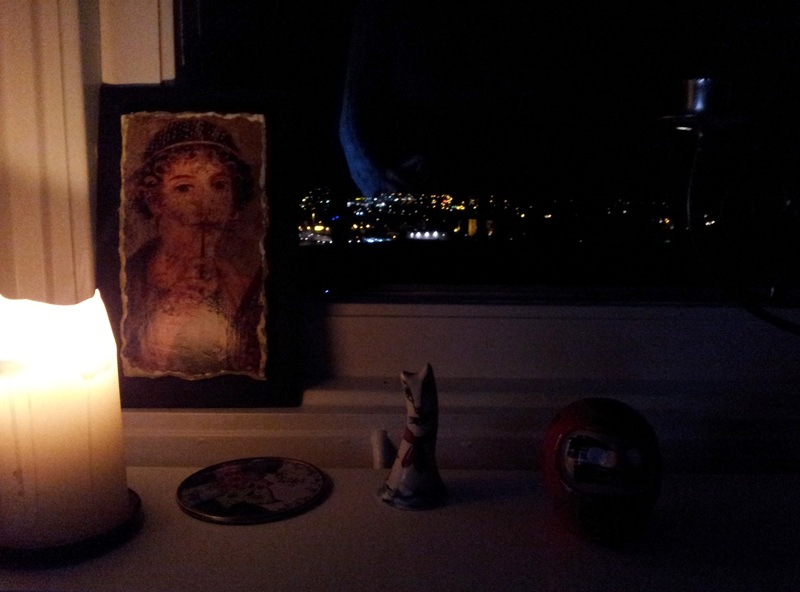 It too seemed bored, and beautiful, which I suppose the reason for it’s status (the beauty, not the boredom). One of the next animals was one that certainly isn’t endangered due to it’s luxurious pelt, and in fact isn’t as threatened as the other animals that we had seen. The description of the wolverine, and what we saw of it, indicated that it’s reputation for viciousness and strength aren’t exaggerated. A solitary wolverine can apparently take down an elk, which is quite a feat for an animal that ranges from between 60-100cms long. While we were there, the first sign we had of it was a pine tree shaking as it climbed down the branches, thereby ruining my possible idea about escaping from them up a tree if I even spotted one in the wild. I really hope I never do, as I am smaller and quite a bit less fearsome than an elk. Usually. After passing a few more unimpressed cats, we reached the enclosure of a cat that definitely fit into the impressive category. I have seen tigers before, and remember then being struck by how trapped they seemed and how threatened by human stupidity they were. The Amur tigers at Nordens Ark were bored, walking around the tracks that had been made by their repeated loops, but I was also able to get a glimpse of how wonderfully stunning and powerful they are. I didn’t know until I just looked it up right now that Amur tiger is another name for Siberian tiger, an animal that I have been fascinated about for a very long time, as it is the largest of the big cats. There were 2 enclosures, one with a high platform that the tigers were sitting on, only able to be spotted by their tails and paws over the sides, but in the other enclosure a single tiger was in full sight, prowling around and ignoring us for the most part. I don’t think I need to go on about how amazing it is to see a tiger, and how sad it is as well, knowing how few are left, as anyone who has ever seen one will know what I’m talking about. Even more impressive than the sight of the tiger prowling however, was when it lay down in a secluded part of the enclosure. Some of us walked around to find it and once there agreed that we were lucky that there was a fence. The tiger lay on the other side and watched us intently, barely moving as we took photos. Staring back into those eyes I wondered what it would be like without the fence and the cage, to be at its mercy. Perhaps, like that day, I would be too transfixed to run. That visit was about 2 months shy of a year ago now, and I still think about the animals I saw there, and my conflicted feelings about zoos and how to protect endangered creatures. As I look at the photos I took there though, there are two things that stand out, more so even than the grumpy cats and cute pandas. One is a brief glimpse of a wolf, an animal that has played such an important part in human culture for most, if not all, of our history. The other is the stare of an immense and powerful cat, trapped behind a fence as a result of human greed, but capable of making me feel like prey, while at the same time wanting to worship it.